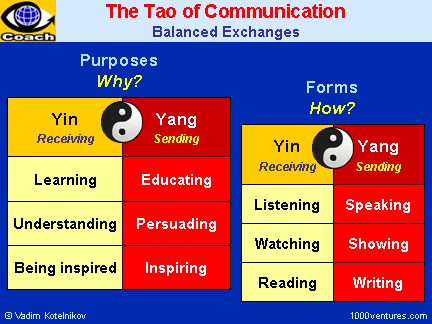 YIN and YANG of COMMUNICATION - The Tao of Effective Communication - Your Communication Success 360 - Knowledge speaks, but wisdom listens. Good communication is not about clever techniques, it is about sincere understanding. Everyone needs a person to whom they can open up. Human beings are desperate to feel important and valued. This amazing quote from Mary Kay Ash "Everyone has an invisible sign hanging from their neck. It says, 'Make Me Feel Important',“ is so true. That’s why great listeners are so popular everywhere. Learn to listen. Show people that their thoughts and insights are important to you. Use silence to encourage other people to talk. Silence, listening and caring about the answers is a great conversation skill. Strive to understand others. Put yourself in the other person’s shoes and try to see things through his or her eyes. Learn to listen to body language and emotions and to hear what isn't being said. Finally, as Wilson Mizner put it, “A good listener is not only popular everywhere, but after a while he knows something.” You should always focus on learning. Learn from the best. Find people who are getting the results you want to achieve and ask them for advice. Always ask people around you for feedback... What mistakes are you making? How could you improve? Learn how to communicate effectively your ideas to others. The two parts of a message – the content and the message – must complement each other. To speak effectively, avoid both too little and too much communication. Break complex messages into parts and explain the relationship of the parts. Know what your body is saying. Communication is not just about the words you use. In fact, you communicate more with your gestures and expressions, your body language. In communication circles, there's the Elevator Speech. You've got to be able to get your key point across in a matter of seconds, in the time you'd spend taking a short elevator ride. Focus is everything. Don't dilute your message. Don't cloud the main issue by insignificant information.